BAUMATIC BMIS3820 Built-in Solo Microwave - Stainless Steel. The Baumatic built-in microwave features a contemporary stainless-steel finish and will fit into a 320-mm deep cabinet. The Baumatic 20 litre built-in 800W microwave has five power levels and eight automatic programmes including vegetable, fish, meat, pasta, potatoes, pizza, popcorn and beverage ensuring cooking is fast and easy. Food can be thawed, warmed up, or cooked using just microwave cooking. Mainly used to cook and re-heat vegetables, potatoes, rice, fish and meat. To help minimize the need for polishing, many Baumatic products have a Mark Resistant Coating. This kind of coating is fingerprint as well as smudge resistant. A Safety Lock is designed to ensure that the control panel of an appliance cannot be accidentally changed during operation. Left hinged side opening door. LED Minute Minder with Function Display. Dimensions 650 x 404 x 445 mm (H x W x D). Boxed weight 17.4 kg. In most cases the packaging remains in good enough condition for transit (just not absolutely pristine). In either case, the item itself will be in new condition throughout. However, this does not include any significant imperfection, such as an obvious mark, scuff, scratch or dent, that would be reasonably visible If this is the case please get in touch immediately. In very good to as-new condition, it may have some minor cosmetic marks or scratches, these will mainly be visible when looking at the item close up and will be limited to the frame, stand or body. A graded item functions like new, but is not brand new and will not be perfect. A graded item may show cosmetic imperfections. A graded item may be re-packaged in plain packaging. A graded item may be incomplete - it may have minor parts or accessories missing that do not affect its functionality. All products are electrically checked, tested and repaired by our factory. We are a family run business who pride ourselves on a 5 customer service, great items and low prices. We aim to respond to any message within 24 hours during working hours. 2 Once you place an order, you are binding into a legal contract. All of our appliances are delivered by pallet courier. Failure to do either of these things will result in the couriers rejecting any claims for transit damage should you discover any at a later date, and you will be unable to return the item on this basis. We are based in Trafford Park, Manchester and are able to deliver locally within 15 miles at a reduced rate and we also welcome collection Please do let us know in either case and we will be able to accomodate you. Get the all latest News, Updates and Special Offers from Emax Outlet. We are an organization which is aiming to be one of the largest online retailers in the UK for new and refurbished products. 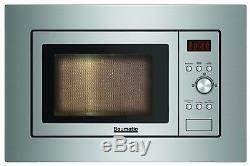 The item "BAUMATIC BMIS3820 Built-in Solo Microwave Stainless Steel" is in sale since Thursday, November 16, 2017. This item is in the category "Home, Furniture & DIY\Appliances\Small Kitchen Appliances\Microwaves". The seller is "emaxoutlet" and is located in Manchester. This item can be shipped to United Kingdom.